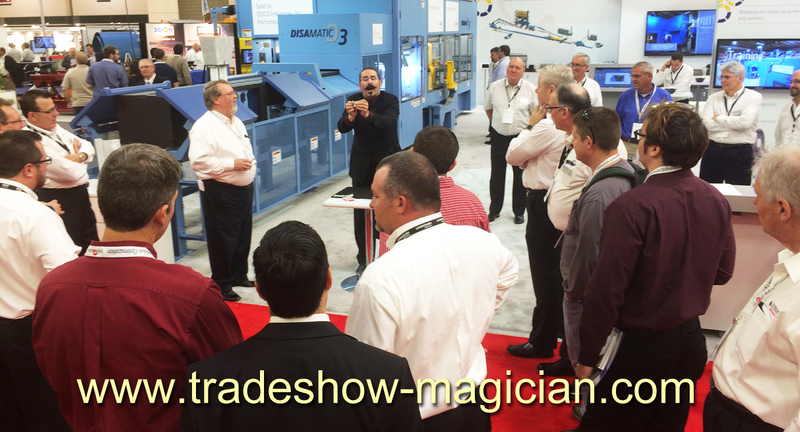 Amazing Trade Show Magician attracts a crowd during Fabtech trade show. During a recent trade show where we exhibited our large scale hologram projector we noticed a crowd gathering on the other side of our clients booth. A trade show magician had been hired to attract visitors to the booth, where they could witness some incredible magic with a branded company message attached. The magician incorporated the clients sales message into his presentation which seemed to go over quite well with the crowd which eventually spilled out into the aisle. Magician attracts a crowd at the Fabtech Trade Show. It all started with a mouse! “It all started with a mouse.”…… Actually it was Walt Disney who was first credited with saying this. Years later Magician Timothy Drake would make the very same claim when he developed Trade Show Holograms, a company that manufactures 3D Holographic Illusion Projections in Kiosk form for display at trade show booths across North America. One of Timothy Drakes first Holographic Projections was a Dancing Mouse featured as a special effect at the Shriners Haunted Mansion. The popular 3D hologram effect eventually lead to a market featuring the eye catching illusion at trade shows and as part of special exhibits. HoloTube Life Sized hologram projector creates 3D holographic representative.